In our commitment to provide you with products that can help keep your skin in its top condition, we present to you 5 in shower body lotions that lock-in moisture immediately right after your bath. After hours of review and testing these products out, we picked what we feel is the best in shower body lotion and moisturizer based on ingredients, ability to maintain the skin’s softness and suppleness and value for money. The Ultra Moisture In-Shower Body Lotion by Olay claims to turn dry skin into healthy skin in just 5 days. It is packed with tons of Olay moisturizers so you get results after the first wash. Tested by dermatologists, the In-Shower Body Lotion by Nivea keeps skin hydrated for over 24 hours without the sticky feel. It is easily absorbed by the skin and provides instant results, too. Eucerin’s In-Shower Moisture Body Lotion is the only fragrance-free product on our list. It boasts of its hydrodisperion technology to continuously moisturize the skin even after rinsing it off. With long-lasting moisturization, the Creamy Moisturizing Oil by Aveen﻿﻿o leaves skin soft and supple without the greasy feel you usually get from body oils. It comes in a handy pump bottle. The quick-absorbing formula of the Wet Skin Moisturizer by Jergens makes skin twice more radiant after stepping out of the shower. It has 5 variants to suit everyone’s discriminating taste. Promising results in 5 days, this best shower lotion & moisturizer improves the skin’s hydration by 60% making it smoother and softer. It doesn’t leave skin feeling oily and is a rinse-off type. This in shower lotion contains Shea Butter which fights aging by boosting the production of collagen. It’s also loaded with Olay moisturizers to reveal healthier-looking skin in just one wash. It comes in an inverted white bottle with a yellow flip cap making the product easy to dispense. There’s a hole in the middle top part of the bottle, but we really aren’t sure what its purpose is. So you could hang it in the shower, perhaps? Its consistency is a bit thick so we had some difficulty to spread it all over our body. Its scent is also more on the feminine side so if you’re a guy, you probably won’t like this product. The product rinses off easily without a filmy residue behind. A little goes a long way: squeeze out a pea-sized amount on one hand and use the other hand to apply it all over your body. It has an EWG﻿﻿ ratin﻿﻿g of 4. Tested by dermatologists, this in shower lotion provides moisturization that can last for more than 24 hours. It is a rinse-off type as well and won’t leave skin feeling sticky or uncomfortable. It contains Cocoa Butter which is a great moisturizer and prevents skin peeling and dryness. It is also rich in antioxidants which help fight aging by boosting elasticity and collagen production. This product comes in a white inverted bottle with a blue flip cap that closes securely making it very travel-friendly. The back side gives a detailed instruction on how to properly use this lotion. It doesn’t have a thick consistency and it easily washes off without leaving any residue. But like the first product, its scent is more feminine so guys might want to check out their other variants. This in shower lotion is very moisturizing it even helps calm skin with eczema. People also use this product to heal their cracked heels but we just advise you to be careful to prevent accidents. It has an EWG score of 4. Fragrance-free, this in shower lotion deeply moisturizes the skin without leaving any oily residue behind. It is a rinse-off type, too, and has low chances of irritation with an EWG rating of 2. It boasts of its hydrodisperion technology which allows it to nourish the skin even after washing it off. It is also infused with Pro-Vitamin B5 that helps fight aging, itching, or other skin irritation. This in shower lotion comes in a white upright bottle with a red flip cap. Its consistency is also not that thick which makes it very easy to apply and wash off. 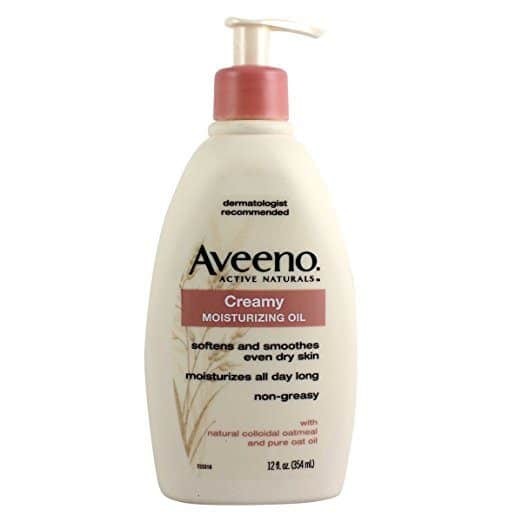 With this product, there’s no need to apply extra lotion even in the harsh winter months. It works for people with eczema and since it is free of fragrances, it is perfect for both men and women. We also like that it offers results from the first wash itself. But it is a bit difficult to remove the slippery feeling off the floor, so you have to scrub really hard to avoid any kind of mishap. Easily absorbed by the skin, this in shower moisturizer leaves skin feeling soft all day without the sticky feel of most oils. It comes in a convenient pump bottle to easily dispense the product. Its main ingredients are colloidal oatmeal and pure oat oil. Oatmeal helps lock-in moisture and restores the skin’s pH balance while Oat Oil has anti-aging and anti-inflammatory properties. Despite the name, comes off as a white lotion that is so lightweight. It has a weird smell at first, kind of like play-doh, but it dissipates quickly and turns to this subtle, florally-powder smell. It sounds girly, but guys don’t find it off-putting and don’t seem to mind. It is quickly absorbed by the skin you can immediately touch things or wear your clothes without worrying you’ll leave a residue behind. Some use this to moisturize both their face and feet, too. Readily absorbed by the skin, this in shower lotion locks-in twice as much moisture to leave skin soft and healthy-looking. It comes in a blue bottle and has a scent that reminds you of summer. Its main ingredient, coconut oil, is known for its moisturizing abilities and can treat a lot of skin conditions. This in shower lotion is very easy to apply without leaving a greasy residue behind. This product moisturizes the skin for a longer period but for us, it doesn’t last the whole day. We also noticed that while it moisturized other parts of our body, it didn’t really help with our hands. It is off-white in color and has the right consistency it doesn’t slip off your wet hands. The smell isn’t overpowering so you can layer it with products right away without worrying about the scent. The best part is it doesn’t need to be rinsed so there’s no fear of your floor or tub being slippery. Our only concern is, like the previous product, is it has a “moderate” EWG score as well. If you are suffering from dry skin, these best lotions for dry skin should definitely be a part of your daily routine. However, research shows it is best to moisturize skin right after taking a bath. Applying lotion to damp skin allows it to lock in more moisture to keep it hydrated the whole day. Which makes a lot of sense. But if you’d still rather stick to your good ol’ lotion, here are 3 more reasons that might change your mind. Moisturization should be part of any regimen and in-shower lotions allow you to skip that step. With it, you can immediately hydrate the skin without needing to dry yourself off. Normally, we would first towel-dry ourselves first before stepping out of the shower to apply a moisturizer. With in shower lotions, you can get to hard-to-reach areas easily and mess-free. Just make sure to wash the bathroom floor to avoid any accidents. You might think they’re not working since they just slip off your skin, but that’s not the case. In-shower lotions are formulated to work with water to provide moisturization even as you get dry. This results in soft and smooth skin that lasts throughout the day. Which Moisturizes My Skin More: Lotions or Oils? Constant moisturization is an effective way to “turn back the hands of time” especially now that we’re not getting any younger. But moisturizers are often divided into two: lotions and oils. Which got us thinking: are they just the same or is the other superior? We list down the benefits below to help you decide which one works better for your skin. So as you can see, both of them are pretty much the same. But if you’d ask us, we’d go for oils since they don’t have a shelf life, are ideal for all skin types, and contain no fillers. Just look for oils that are “cold-pressed” to ensure you’re getting all of the healthy stuff. If in shower lotions still aren’t a part of your daily bathing routine, you’re missing out a lot. Aside from being time savers, they’re a whole lot better than their regular counterparts. This is why we chose the Ultra Moisture In-Shower Body Lotion by Olay as the best shower lotion & moisturizer. It promises to improve skin texture by up to 60% in just 5 days of daily use. This rinse-off in shower lotion is infused with Shea Butter that helps boost collagen production. It is also loaded with Olay moisturizers to keep skin so soft and radiant. Best of all, it is very affordable. This drugstore item can easily fit into anyone’s budget so there’s no excuse to not have one in your shower. Stefanie is the owner of ThankYourSkin. A self-proclaimed beauty and skincare junkie, she is all about helping people find the best products for their skin.